Stunning Elizabethan family home with fabulous gardens, shops and food. lease use the calendar below to view what's on and select the date of your visit. Hover the mouse over a date to see times and sold out events. For many, the Gardens at Doddington are just as spectacular as the Hall itself. Remaining faithful to the original Elizabethan layout, mellow walls provide the framework for the formal East Front and West Gardens. Beyond the West Gardens begin the lovingly restored Wild Gardens. 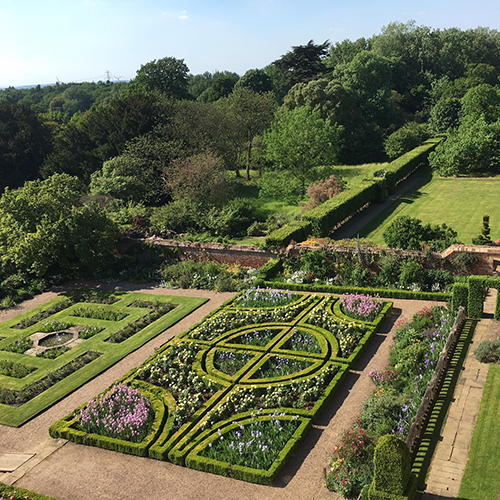 Over the generations, most recently by Antony and Victoria Jarvis and Claire and James Birch, the gardens at Doddington have been restored, cared for, nurtured and developed to their fullest potential. A free spring spotters' trail will be available for children to explore the gardens during the Easter holidays. Doddington season ticket holders, Historic Houses members and RHS members benefit from free entry to the Gardens during normal opening times. Please show your card on arrival at the Gatehouse. Find out about our Doddington season tickets on our online shop, offering fantastic value and valid for use during normal opening times and Christmas opening for a whole year from date of purchase. To round off your day why not stop by our Cafe, before exploring our Farm Shop, Country Clothing store, Home store, Giant Bike Shop and award-winning Restaurant. Tickets only valid on selected day, tickets are not timed, you can visit during 11-4.30pm (last entry 3.30pm). Please note that tickets are non refundable and non transferable.